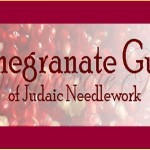 The Delaware Valley Chapter of the Pomegranate Guild of Judaic Needlework will be meeting on Feb. 5 at 850 Evesham Road in Cherry Hill, NJ at 7 p.m.
Diane Arlene Spector, president of Masorot, the Philadelphia chapter is an artist and calligrapher who will present an original design of the Seven Species which represent the seven agricultural products of Israel. The techniques of surface embroidery and cross-stitch will be taught. This project can be used as a wall hanging or pillow. For further information call (215) 782–8041 or email harfra_f@verizon.net.